Fourth Row Center: Film Writings by Jason Bailey: On DVD: "Food, Inc."
"The industry doesn’t want you to know about the food you’re eating," we’re told at the beginning of Food, Inc., “because if you knew, you might not wanna eat it.” That’s the general thesis of Robert Kenner’s sobering documentary, which explores the various manners in which the advertising fantasies of pastoral farming and agriculture cover for a food industry that has become unethical, over-engineered, and, in many cases, dangerous and deadly. One of the earliest images of the film is one of its most subtly comic: Eric Schlosser, author of the vaunted-exposé -turned-mediocre-film Fast Food Nation, ordering a cheeseburger. He gives the viewer a terse but effective history of fast food in the United States, and how the demand for low-priced mass quantities of fast food fodder led to radical changes in how the business of providing food for Americans. Some of it is genuinely shocking. Much time is spent on so-called chicken “growers”—the emphasis is on the final product and not the animal, since, as we’re told, “it’s not a chicken, it’s food.” We get a glimpse at the CAFOs (Concentrated Animal Feeding Operations), which slam as many animals as possible into poorly-ventilated, pitch-dark facilities, where they can be fattened faster and more effectively by corn engineered for that express purpose. We see how farm subsidies have allowed massive utilization of corn as food for cows, and the unexpected consequences (such as e-coli outbreaks). And we hear the heartbreaking story of an activist whose son was killed by an e-coli-tainted hamburger. Kenner’s muckracking doc takes viewers into several other dark and unfortunate corners of the industry. Hidden cameras go inside the largest slaughterhouse in the world, the Smithfield Hog Processing Plant (where 32,000 hogs are slaughtered per day), complete with chilling footage from the “killing floor.” Causes are examined for the flood of illegal immigrant workers into meat-packing plants, and the not-unreasonable question is asked: why is it that those workers continue to be arrested, but not the company management that actively recruits and hires them? The failure of food regulatory agencies is investigated, with a not-unpredictable outcome (guess what? They’re controlled by lobbyists and food-industry company men). The complex but shockingly unfair regulation of “seed sharing” is examined, as is the conundrum of poor families trying to eat on a budget, which leads them to McDonald’s dollar meals and other economically priced but toxic foodstuffs (“The biggest predictor of obesity is income level”). The picture is well-organized into several individually titled chapters; the canvass is broad, but the segments are tight and the film never rambles. It’s focused, with scores of information imparted in a straight-forward, plain-spoken fashion (with the help of some inventive graphics). Some of it is pretty hard to watch (like the veterinary examination of a cow, or even the comparatively humane chicken slaughter), but it’s not a total downer—the move towards (and demand for) organic food is seen as a something of a cautiously optimistic ray of hope. In a movie that seldom steps wrong, Food, Inc. does go irritatingly strident in its closing text, which offers a series of instructions for better, safer food living, somewhat in the manner of the closing credits of An Inconvenient Truth. But here it’s too much, too pushy; particularly in the sympathetic audiences that Food, Inc. is most likely to play to, we can figure this stuff out on our own, thank you very much. Until then, though, this is a compelling, intelligent documentary, full of alarming information and genuine passion. 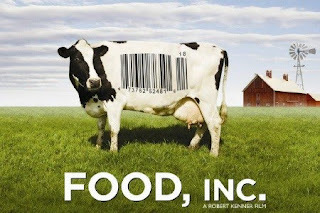 "Food, Inc." hit DVD and Blu-ray on Tuesday, November 3rd. Labels: documentary, DVD, food inc.